The bus is full but not crowded, with just one young woman standing. Still, when a man gets on, he deliberately stands too close to her and eventually touches her. A young man nearby hesitates. Should he say something? No, he decides, turning away from the woman’s clear discomfort and watching as she gets off the bus. That’s one ending to the first of three videos that Eliana Barrios Suarez, associate professor of social work at Wilfrid Laurier University, developed with community partners as part of a project aimed at reducing gendered violence in the city of Ayacucho, a post-conflict community in Peru. Fortunately, there’s another possible ending. The video returns to the moment of choice for the bystander, who decides he will intervene. This time, he loudly asks the man why he is touching the woman, which empowers the woman and others on the bus to confront the aggressor too. “If you’re not part of the solution, you’re part of the problem,” the video’s tagline reads in Spanish. It’s the main message Suarez, her community partners and her primary research assistant, Laurier undergraduate student Andrea Morales, are trying to convey through their prevention program, called El que ve y ayuda/Rikuspa Yanapakuq, “Those Who See and Help” in Spanish and Quechua. Ayacucho, in the Andes mountains of Peru, is a city of 175,000 with a high population of university students. During the 1980s and ‘90s, it was at the centre of armed conflict started by the Shining Path, a group known for its brutal violence as it fought to overthrow the government. Suarez, a native of Peru, though not of the Ayacucho region, has been working with the local community for more than 10 years. While rates of violence against women are not necessarily higher than elsewhere in Peru or the rest of the world, “what’s different is that the community wants to do something about it,” says Suarez. Working with Peruvian partners including Loyola Centre Ayacucho, a faith-based social justice organization, and faculty from San Cristóbal de Huamanga National University, as well as with Laurier faculty members Ginette Lafrenière and Jennifer Root, Suarez developed a sexual violence prevention program rooted in local traditions and concerns. El que ve y ayuda advisory committee. Eliana Barrios Suarez is third from left, front row. 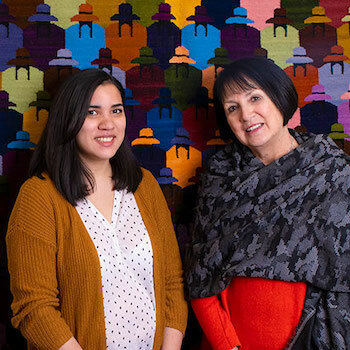 Suarez received $73,000 in funding for the project from the Social Sciences and Humanities Research Council of Canada (SSHRC), which allowed her to hire a Laurier research assistant as well as a field worker in Peru. Morales was a second-year Global Studies and French student in the fall of 2016, when she heard a social work professor was looking for a Spanish-speaking assistant. Although Morales is also originally from Peru – she came to Canada with her family when she was nine – she didn’t know Suarez or what to expect of social work research. A meeting with Suarez quickly convinced Morales that she wanted to get involved with the project. In addition to assisting with research, translation, communications and logistics from Canada, Morales accompanied Suarez on two trips to Ayacucho, in 2017 and 2018. During the first trip, she helped survey community members and listened to their ideas and concerns. During the second trip, which was three weeks long, the team trained facilitators and rolled out the developed prevention training on a pilot basis. Andrea Morales, left, with workshop facilitators and Eliana Barrios Suarez (third from right). Morales co-led some of the workshops with a local facilitator. Initially, it was nerve-wracking. She was born in Lima but hadn’t been to the Ayacucho region, one of the poorest in Peru, until her first research trip and was conscious of her different accent and lack of local knowledge. Soon, however, the workshops became powerful vehicles for connection. Many participants shared personal experiences with sexual violence. Morales felt most people came away from the workshops with greater empathy for the victims of gendered violence and a new conviction that they should intervene as bystanders if it is safe do so. Those impressions were borne out by Suarez’s research. Morales, now in her final year of studies, says working on the project changed her for the better. Not only has she learned a lot about the research process, developed her presentation skills and formed a strong connection with her mentor, she has grown in confidence and adaptability. Suarez will be going back to Ayacucho this spring to wrap up her part of the project. The interdisciplinary project, however, will carry on. She’s handing it over to the local advisory committee, the Loyola Centre and San Cristóbal de Huamanga National University, all of which have started to carry out the training developed. More than 300 people have been trained to date, says Suarez. Before she ends her involvement, Suarez plans to develop training modules adapted for specific groups, such as bus and taxi drivers’ associations, that have requested it. She is also planning to ensure project materials are translated to Quechua so the prevention training can be brought to surrounding rural areas where not everyone is fluent in Spanish.